I will try to put into words how I felt about the game. Not in just a mechanical level, that I can do with other threads. Rather, I wish to share in this post what I and my playing group felt revisiting our favorite setting in a completely new way, through the Dark Promises adventure. L5R matters dearly for us, so forgive me if it sounds a bit too emotional. I have started back in 2006. To me, L5R was something I always knew but never tried. 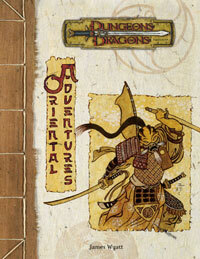 The "Oriental Adventures" supplement for D&D 3.X who somehow ended up in my third world, South American Local Game Store beckoned me forward. Its cover was beautiful. While I was looking just for the next cheap class thrill for my ongoing D&D 3.X game, a familiar name popped in that book "Legend of the Five Rings". I was completely captivated by the setting, so much so I threw my old D&D game on the back burner and went ahead to hunt down all the old L5R books I could find. And for eleven years, I was hooked. And so, however, manages to share a table with me, I pride myself on being able to make others feel excitement for L5R, even it's just a glimpse. L5R is pure joy. And I wish to share this joy with the world. When AEG announced it had sold the rights to FFG, the internet was set ablaze discussing the new card game. I couldn't care less about any of that cardboard stuff. What about the setting that I love? I was so scared and frustrated, in particular, because my favorite factions wouldn't make a showing in the now rebooted universe that I cursed the heavens. "Why is L5R changing?! Why can't we keep getting supplements for 4th edition? Every single god **** supplement we got was top notch stuff. What about the Winter Court? What about the Mantis? The Minor Clans? Rokugan your way? Different timelines? What about...The Spider?" - I went ahead towards a playtest session with my fiancee, another L5R fanatic (A very casual RPG player usually - But not for L5R. She loves it and dedicates time and effort to learn the ins and outs of the mechanics and the setting with this one) and one of my oldest friends who also places L5R in a special place when it comes to gaming. "Oh look how cute they returned the twenty questions thing from the past edition!" "Nice this will hopefully help newbies to this setting to craft interesting characters as for mine I'll..."
"Wait a minute! To create a character, you must play the game of twenty questions." The first character created was a deaf Samurai, that is actually quite scared of death and what lies beyond, grasping at whatever mystical bauble or mysticism he could get to keep his mind at ease. The second one is a fierce, anti-social Matsu who was forced into an Akodo school so she could refine her anger into something more honor-bound. Secretly just wishes to be left alone, despite being loyal to the Lion's goals. Just as we were ready to delve into the Dark Promises adventure, we realized the characters had 24 XP points to spend as described in the intro for the adventure. So they focused on buying off stuff that would allow them to pass over to rank 2 because why not, right? This is where I discovered there is some questionable stuff in the Akodo Commander progression. - Sun and Suzaku arrived at Ishikawa Mura, the players were quick to "snap" into Emerald Magistrate roles due to their familiarity to the setting, with Sun proposing Suzaku to play the part of his Yojimbo, in which Suzaku accepted. This made the fact that Hirohide wished to pursue Michiru on his own while they were tasked to hunt down Keinossuke much easier and natural. - Because Suzaku is to guard Sun, she followed him around. No party splitting! This allowed the duo to roll more and often when they examined the crime scene. In a surprise twist, Suzaku was the one who uncovered most of the information of the crime scene while Sun was feeling the dread (strife) of confronting such a gruesome mortality scene. - Water Opportunity activated by one particular spicy roll from Suzaku gave her the whetstones. - This actually added tension to all other scenes, for the players were trying to reformulate and understand the fateful crime scene with every information they could piece together. For instance, Suzaku figured out that Hida Kayo was killed while suffering two wounds, of which one was fatal. Confronting the heimin in charge of cremation of the body, they manage to develop a theory that Kayo killing blow came from behind, meaning he was probably distracted by the first blow. - Naturally, all this talk about cremating bodies with Heimin gave Sun even more strife. Poor Scorpion just wishes to tell the fortune right now, only to be sure he won't die today. - It was when Mirumoto Chiaki was introduced that Bayushi Sun time to shine came into the picture. Quickly realizing the Dragon is hiding something, the Scorpion pretended to know exactly what Chiaki was hiding and blackmailed her into revealing whatever she knew about Hida Kayo's last moments. - Not even Suzaku realized Sun was lying about this. Well, that's a Scorpion to you! And with that, we finished the Prelude. - Giving schools two different technique pathways is pure genius. Allows for more diverse characters even within a single school. - The idea of mechanics shaping the narrative just by being there is something that exists throughout the book, which pleases me immensely. - I hate funny dice. - However, the fact that there are only 4 symbols help the system a lot. It's easy to read, painless even. - The opportunity system is something I need to master, but I didn't feel it to be intuitive outside combat. - I thought I was going to hate it. - Turns out, approaching things a certain way is very flavourful and fits the setting perfectly. Next post, Chapter 1 of Dark Promises. Why can't we keep getting supplements for 4th edition? I think it's more a feel that since FFG is trying to make the setting 'mass-market-able' via pushing the LCG to a bigger audience than before, they wanted to 'reset' the universe, and hence reset the RPG along with. On the plus side, we get the LCG fiction https://www.fantasyflightgames.com/en/products/legend-of-the-five-rings-the-card-game/ and access to the excessively pretty artwork they always produce for their products. What about the Winter Court? We don't know what organised events or supplements they'll produce. This is just a beta, after all. That was an actual conversation that happened as we were checking the pdf for the first time. Maybe we are spoiled, with the unofficial character generator for the 4th edition of the game as well the fact almost every single mechanical decision you had in the past games (as well on this one) impacted a concept of your character. This isn't a traditional RPG in the sense that you need to go further with characterization when you put in "Elf Fighter" in your character sheet. Being part of a clan is a big deal. Being part of a family is a big deal. Studying in a school one can "physically" visit in the game world is a big deal. So while we felt that the game of twenty questions of old was great at helping newcomers but unneeded for those who are aware of said game concepts, the one in FFG's L5R is pretty much just a 20 step character sheet creation. Which is fine, I guess. I get that you can 'rush' through it if you already know the setting really well, but at the same time we've found it great for making people flesh out background much more than "I am Elf Fighter". It's especially good for people who don't know the setting too well. I have to say we've liked it too. The nice thing about every distinction (for example) working the same way, is that there's never a balance 'issue' with the GM pulling a custom one out of the air - the only question is "will it trigger often enough/too often/about right", what it actually does is always the same. My players have created two characters each, and in their second mini campaign I think about half of them have a non-standard distinction or adversity; one of the courtiers having 'Natural Deal-Maker', for example, which fitted his personality and is easy enough to see when it can be used and when it can be used against him. I've played the Star Wars RPG and WHFRP 3rd, so I can deal with funny dice. I'll be much happier once I can get actual dice rather than the app die roller, though. Outside conflict scenes, it works amazingly well. Well I'm looking forward Intrigue, Skirmish, Duel (who is getting a bit of rework soon, apparently?) and Mass Battle scenes then. I sure hope they tweak Mass Battle soon if it is clunky because I was a heavy user of the Mass Combat in 4th edition for better or for worse. I liked the ideas that I read for it, but I gotta test it. We actually cutted the paper dice and glued over some old d6s and d12s - They work like a charm.